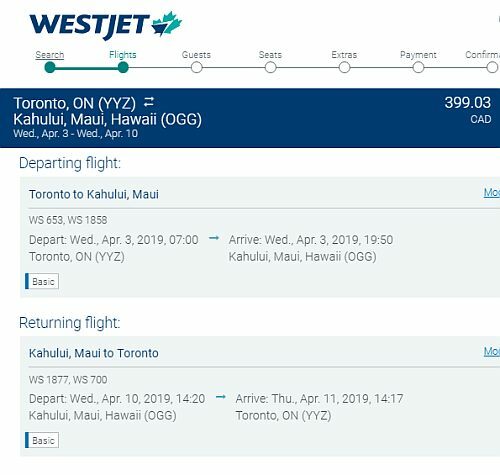 WestJet is showing flights from Toronto to Maui, Honolulu, Kona, and Kauai, Hawaii in April 2019 for $399 to $405 CAD roundtrip including taxes. You can find dates in January, February, and March for about $40 more. You can also find similar prices from Hamilton (YHM) and London (YXU). 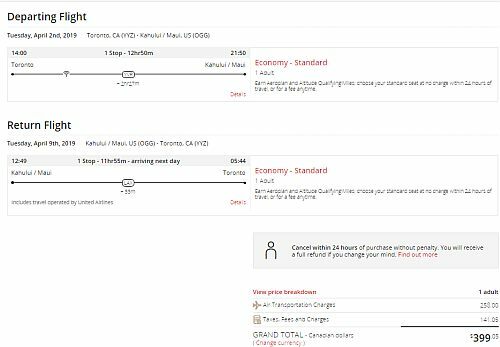 Update 1/7 - Air Canada has now dropped the price of their flights from Toronto to Hawaii into a similar price range. See update below. 3. Search for a flight from Toronto to your destination in Hawaii. Use the same dates you found on Google Flights with the links above. toronto, yyz, westjet, flight deals, united states, honolulu, hawaii, hnl and north america. 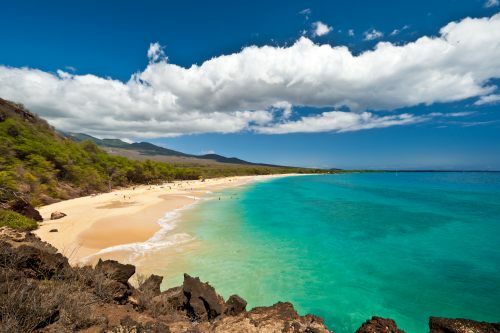 10 Responses to "Toronto to Maui, Honolulu, Kona, or Kauai, Hawaii - $399 to $405 CAD roundtrip"
This is a great price! However, I am amazed at the flight durations to get from Toronto to Maui and back. Toronto to Rome, Italy is about the same distance and you can fly there direct in 8.5 hrs. Flying via Westjet to Maui however appears to take anywhere between 15 hours to almost 30?! Do any experienced Hawaii travelers have suggestions for us cold Ontario folk? Thanks! When we went to Honolulu from Toronto, we had a stop over in Denver Colorado. Then returning from Maui we had a stop in San Francisco. Pretty sure all Toronto flights have a stop somewhere. It’s a full day of travel but so so worth it!! Makes you long for the days when Wardair ran 747’s direct Toronto to Hawaii back in the 70’s and 80’s. Took about 9.5 hours going west and 8.5 hours coming back east because of the jet stream winds. This was 40 years ago and, as an employee, I took this flight numerous times! Progress eh? Thinking of booking this deal! Thanks Chris! Thanks again for alerting us to this amazing deal! Thanks Chris. Just booked this! Best price I’ve seen so far to Hawaii. Airlines have slowed down their flying time to conserve fuel. 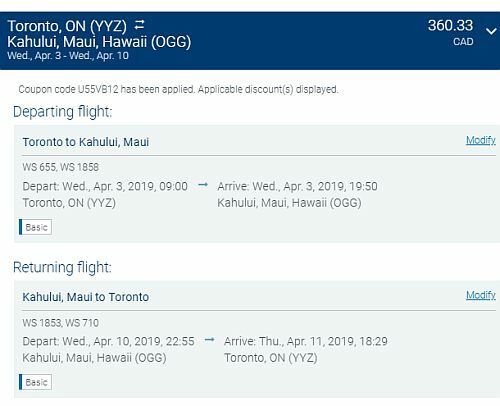 It's still possible for these flights to fly direct to Hawaii just over 9 hours but the fuel consumption increases which in turn would be passed on to the consumer. West winds to Europe are lovely and so cut out time but same rules apply. Looking at my calendar as I've never been to Hawaii. Thanks so much Chris. Anyone know if a 2 hr layover in Vancouver is enough to get through US security and onto the connecting flight to Hawaii? Do bags go straight through from Toronto or do we need to collect those in Vancouver and re-check them? Thanks! Does anyone know how long this offer will last? Trying to round up some friends before booking but worried the deal will end very soon!